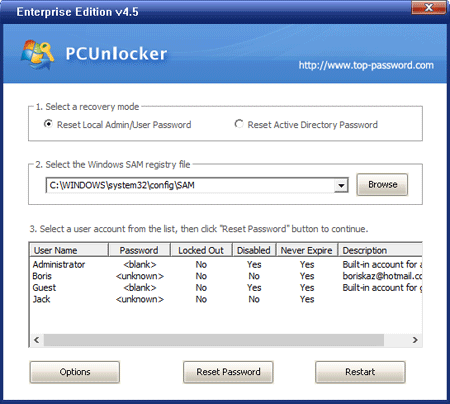 PCUnlocker is a bootable utility to bypass / reset forgotten administrator or other user passwords on Windows 10 / 8 / 7 / Vista / XP / 2019 / 2016 / 2012 / 2008 / 2003 / 2000 and Active Directory (AD) servers. Instantly unlock your system if you have forgotten Windows password or user account is locked out or disabled. 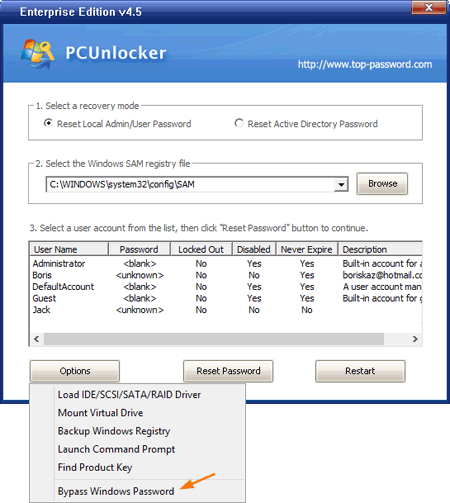 PCUnlocker is designed to help general users to remove forgotten Windows passwords by burning a bootable CD/DVD or USB flash drive. Reset forgotten domain administrator and user passwords for Windows 2000, 2003, 2008, 2012, 2016 and 2019 AD (Active Directory) domain controller. New! Create new local admin account when Windows can't load the user profile of existing account. Support password reset for Windows 10 / 8 local account and Microsoft account. New! Bypass the password of Windows local / Microsoft account without modifying the old password. Reset passwords for Windows 10, 8.1, 8, 7, Vista, XP, 2003, 2000, NT, Windows Server 2003 x64 Edition (64-bit), Windows 7 64-bit, Windows Server 2008 / 2012 / 2016 / 2019. Reset Windows passwords with a bootable CD, USB drive or network over PXE. Support Windows 10 / 8 computers with UEFI Secure Boot, including Microsoft Surface Pro, Apple Mac, ThinkPad Tablet 2, Dell Venue 8/11 Pro, Toshiba Encore. New! Mount virtual hard disk (*.vhd, *.vhdx, *.iso). 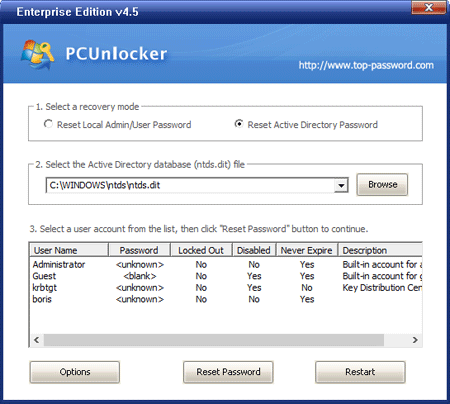 There are three editions of PCUnlocker - Standard Edition, Professional Edition and Enterprise Edition. Make sure you get the right edition to reset your lost Windows password. Create new local admin account New! Boot UEFI-based computer from CD or USB drive New! Boot your locked PC from the network using PXE New! Find product keys for Windows, Office, SQL Server, etc. Screenshot 1: Reset local administrator and user passwords (for most computers). Screenshot 2: Reset domain administrator and user passwords (for Active Directory servers only). Screenshot 3: Bypass Windows local or Microsoft account password without reseting the current password. You forgot or lost your Windows password (including Administrator). "Just a brief note to say thank you for your software. This worked perfectly first time, against other software which I've used in the past, this was miles ahead of everything. I will certainly recommend your company and your product if I have the opportunity to do so. Once again, Many thanks. " "I have a computer with Windows Server 2012 R2. The computer is hardly ever used. I decided to turn it into a server but cannot remember the administrator account password. I cannot log on at all. what do I do? I do not want to loose the OS or the data that is on it. PCUnlocker is the very right boot CD that got me out of this situation! Thanks for this incredible AND affordable software!!" "I recently bought a used computer from a pawn shop. At start up it ask for the administrative password. I can't do anything without the password. PCUnlocker helped me blank the administrator password in minutes! Thank you!" "I was able to reset the Administrator password and regain access to my computer. Thank you for such an awful boot CD!" Learn how to reset lost or forgotten Windows password instantly with a CD/DVD or USB flash drive. Display all Windows accounts on your PC, but cannot reset the passwords.